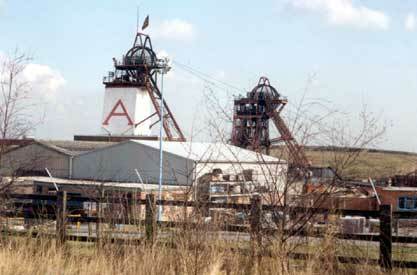 Annesley Pit near Kirkby-in-Ashfield was sunk in 1860 and began production in 1865. I worked at Annesley 1970 - 1988 as a face worker, hard times but miss the mates. By 1982 the Annesley Bentinck Concentration Scheme was completed, but the pit closed in January 2000. Photo H.G.Owston of Annesley Woodhouse 1909. This picture of Annesley pit was taken in 1991. On privatisation the pit was sold to Coal Investments PLC, and then Midland Mining Ltd. Coaling ceased in January 2000, despite claims of 20 years of reserves available in the Blackshale and Lowmain seams if they had been worked more sensibly. Bentinck went at the same time and both sites are now more or less cleared. 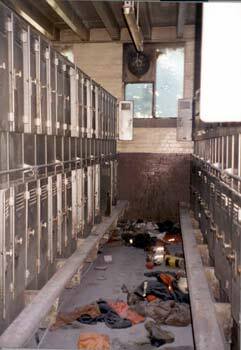 One of the Annesley locker rooms in late December 2001. I don't know just how long salvage work went on after cessation of coaling, but it was an eerie scene, with boots, socks, jackets, helmets and half used shower gel strewn around, almost as if from the night before. The other part of the Annesley mine was Bentinck near Kirkby-in-Ashfield, amalgamated with Annesley by British Coal by 1982 to form the Annesley-Bentinck Concentration Scheme. 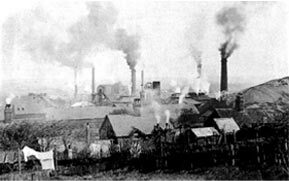 All coal from the take of these mines now went via drift to the surface prep' plant at Bentinck, with men and materials via Annesley's shafts. Bentinck's shafts had been sealed some years earlier. The surface prep' plant was the biggest in Europe, and this picture from December 2001 shows it partly demolished. 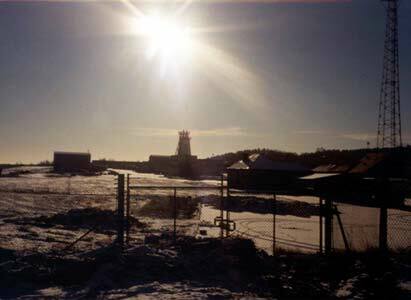 The site is now (December 2002) virtually flattened, with one new devlopment for methane gas extraction/power generation now on site.